Being an advanced user, i love to try custom ROM’s on my android devices. But as it is with custom ROM’s, you are bound to face a bug or two eventually and in extreme cases, if your phone malfunctions, you will need to flash the stock ROM in order to get your smartphone serviced at a service center under warranty. Generally i used to download stock ROM’s for my Samsung based android devices from Sammobile.com. The probelm is, Sammobile didn’t actually hosted the stock Rom’s on its website, rather all the stock ROM’s were hosted on Hotfile.com, a free file hosting service. Unfortunately last year in December, Hotfile.com was shut down due to a massive copyright infringement notice and along with it went all of Sammobile’s stock ROM’s for Samsung devices. However, Sammobile has tried to re-upload stock ROM’s for most Samsung based android phones, but still many old stock ROM are missing on the site. 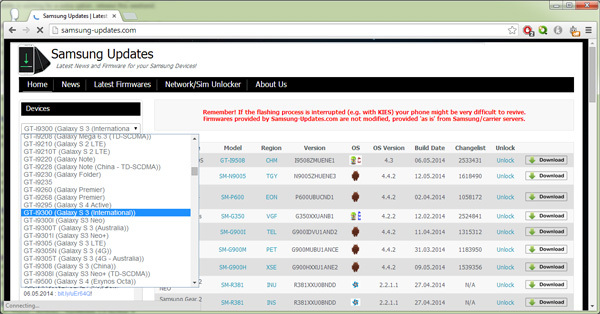 Fortunately, Sammobile was not the only source for stock ROM’s for Samsung based android device. There are other sites such as Samsung-updates.com which have been hosting stock ROM’s for Samsung based android phones on their website. Samsung-updates.com hosts about all the oldest and latest versions of stock ROM’s that were ever released for most Samsung based android phones. The next time you want to download the stock ROM for your Samsung based android phone, you can head over to Samsung-updates.com and select your phone from the drop down list to the left. On the next page you will be able to browse through all the stock ROM versions for the selected android device and download them. If you know of any other websites that offer untouched stock ROM for Samsung devices, let me know about them trough the comments below.